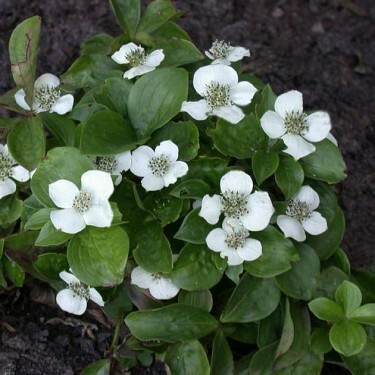 This ground cover has lovely foliage and pure white flowers that resemble a Dogwood. It loves partial shade and will naturalize in gardens across the country. Hardy in zones 1-9! 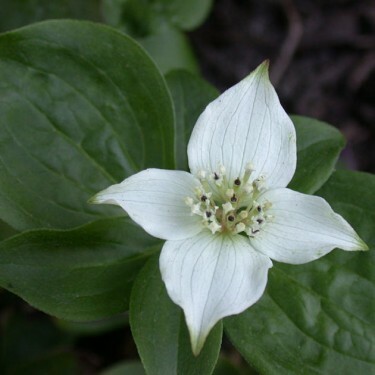 Native to North America, Cornus (Latin: Horn/Antler) canadensis (Latin: of Canada) is commonly called Bunchberry or Dwarf Dogwood. The flowers consist of four white petal-like bracts and a central cluster of small true flowers with tiny greenish-white petals. They look very much reminiscent of Dogwood flowers. The leaves are elliptical with prominent veins and they form a whorl in groups of five to seven. In the fall, the true flowers produce a tight cluster of bright red-orange berries the size of small peas. Very hardy, Bunchberry is rated from Zone 1-9! Watch the Botanus Garden Club video about Ground Covers including Cornus canadensis!